Tonight’s animal encounter was on the other side of the Tamar River at Low Head Coastal Reserve just north of George Town. Low Head Penguin Tours offer fully guided tours to the beach where visitors can watch penguins exit the water and make their way to their burrows. Approaching the reserve, we could see that the tours didn’t start until 9pm, but we decided to walk the tracks and see what they were like. We didn’t see any penguins, but there was plenty of evidence that a large number of ground-dwelling birds lived in the area. 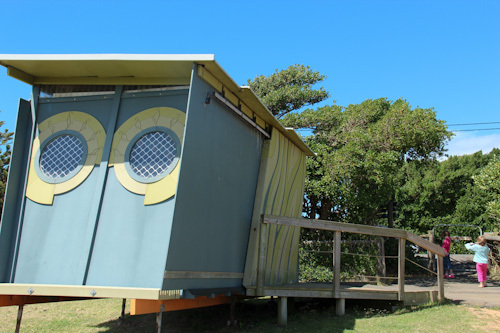 Although it's closed in the daytime, at night this little building acts as an office for the staff at Low Head Penguin Tours. 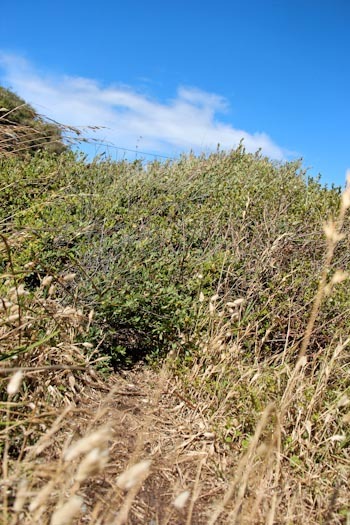 Close to the beach, we start to see little tracks through the bush and burrows in the scrub. 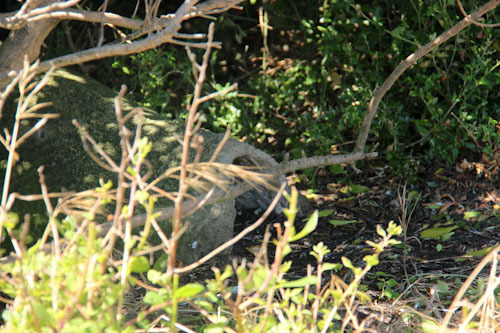 These are the penguins' nests, but the penguins are away at sea during the day, feeding. Other burrows are man-made, built and placed by volunteers who are passionate about the little birds. 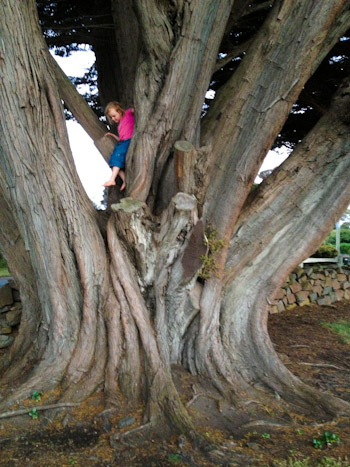 Brioni finds a fabulous old tree to explore while we wait for sunset when the penguin tour will commence. At 9pm, we made the short drive from the playground where we had been waiting and joined the tour. We were a bit later than the main group, and our tour guide Emma cheerfully took us down to the beach and sat with us on the sand as we waited for the birds to show themselves. We follow our guide Emma down to the beach. 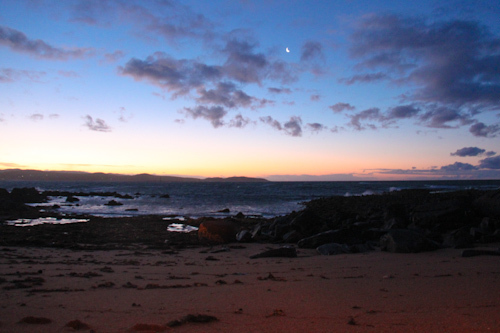 The sun is set before the penguins start emerging from the water. 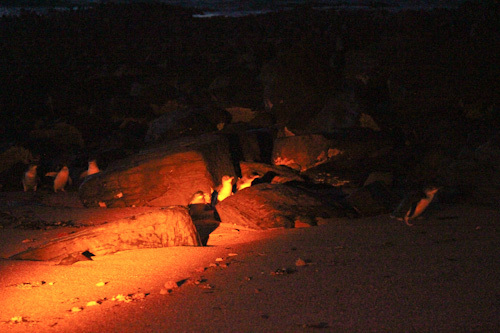 Soon we can start to see the Little Penguins move onto the rocks where they preen their feathers carefully before moving up past the sand dunes to their burrows. These Little Penguins are the smallest variety. The birds are quiet as they come on shore, and as we later walk in the bush we almost step on one on the path. 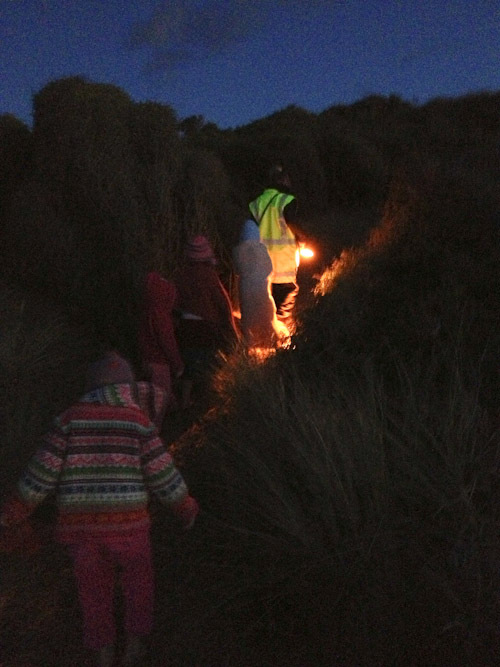 When the wind became too cold for the girls, we headed back up the beach to the relative shelter of the scrub. Penguins were making their way along the paths, and we stopped to have a look at some burrows, listening first to hear the chicks calling for food. 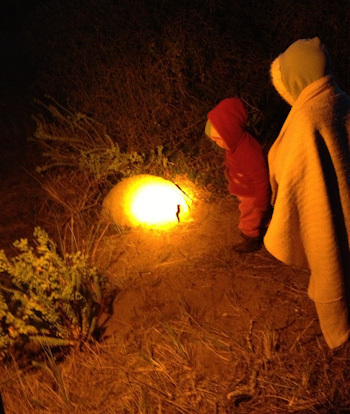 At our guide's suggestion, we approach a burrow carefully to have a look inside. 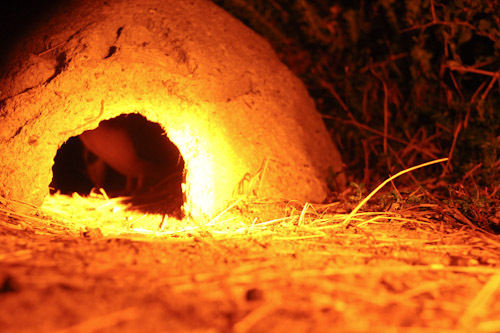 A chick is sitting inside the burrow, waiting for its parents to return and regurgitate dinner. We loved seeing the penguins so close. Our tour with Emma was very personal, and we learned many interesting things about penguins and their habitats. I’ve never seen a penguin in the wild before, and so this was a special moment for me. 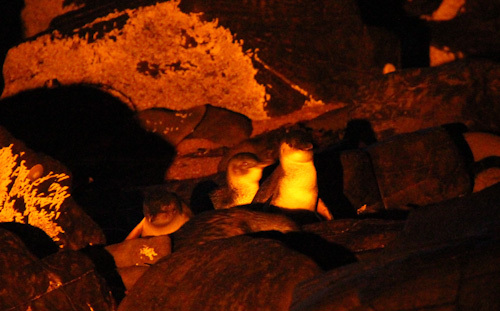 For any visitors to Tasmania, the Low Head Penguin Tour is highly recommended!